I’m a good teacher. I don’t have behaviour management issues in my classroom, and my students get good results. Why do I need to shift my practice to this ‘future learning’ thing? Can we start with the assumption that good teaching = good results and therefore = good learning? I think we can all easily fall into the trap of thinking that when our students get good results in their assessments that is because we are good teachers, but when students don’t do so well, then that’s because they experience some kind of barrier to their learning. I think that if we’re being honest we can admit that sometimes our students learn despite us. I also worry about the equation of assessment results with learning. I think at times we’ve all decried the ‘credit-accumulation’ mindset of our students; that they don’t seem to want to learn for a love of learning’s sake. I worry that assessment, like we have here in NZ with NCEA, whereby discrete content areas or skill sets are assessed in an oftentimes fragmented way, doesn’t actually allow for the kind of learning and skill development that we’d like to see in our learners. Why? What kind of learning do we need our students to have? As we know, we have moved out of the Industrial Age to the Knowledge Age. Wikipedia knows more than it is possible for one teacher to know. The pace of change has increased with a corresponding increase in knowledge. It is no longer really possible to define what we need to know, and it is no longer necessary to store knowledge in our heads in case we need it later on. If we need it, then we’ll Google it. Therefore a different model of education is needed. There are different ways of looking at the future. One of these ways is to discuss so-called ‘wicked problems’. These are problems that are complex and interconnected, such as climate change, food security, the ethics of biotechnology, poverty, etc. These require solutions, but the nature of them is such that they are not easily solved, and in fact implementing a solution for one facet of a problem may well even exacerbate other facets. Therefore we need learners who are capable of dealing with these problems. There have been many attempts to define the skills needed, such as this framework. I also like the ‘4Cs’ of creativity, critical thinking, communication and collaboration. The change here is an emphasis is on skills, rather than content. OK, I can accept that the world looks different today than it did when I was growing up. But why does my classroom practice needs to be different when I can cover the 4Cs within my subject area? I agree that traditional, siloed education can cover the 4Cs, and the NZC’s Key Competencies, but we know more about the way the brain learns these days, and we know that a diet of only traditional, factory-style lecture from the front of the room isn’t it. Just like wicked problems are interconnected and complex, we need to offer our learner the means by which they can learn to apply their understanding in interconnected and complex ways if they are going to make an impact on society. To do this authentically will require a shift away from a subject-siloed approach. What role does technology play in all of this? Why do I have to be a teacher of technology as well as my subject area? Luckily, you don’t. Technology is an enabler. We’ve already acknowledged that Google knows more than a teacher can possibly know, but the search results are massive. We need to teach learners skills to deal with information, how to be critical and discerning with information, how to apply information, and how to make new information. Rather than looking for cool new apps, we should ensure that we use the right tools for the task. But the tasks themselves may well need to shift in order to focus on the skill building we’ve been discussing. Models like SAMR and the eLPF suggest that technology allows us to offer more authentic and genuine learning experiences than have before been possible. Redefined tasks that focus on skill development within an authentic, problem- or inquiry-based context also helps young people to learn how to tackle wicked problems. If it’s all online, why do my students even need me anymore? I’ve been thinking about timetables. I’ve decided that a timetable can be both a literal and a figurative structure. It is the schedule that organises a school day, but it has become a mindset. As adults we know that the world, and even our brains, don’t work in perfectly scheduled 55 minute slots. I believe we do a disservice to our 21st Century learners when we offer than a 19th or even a 20th Century-style education model like this. So, if the emphasis shifts from content to skills, what else can you offer your students? A positive learning-based relationship, encouragement and motivation, learning opportunities, an expert network to tap into, access to you; the most experienced learner in the room. You know, all the stuff that does make you a good teacher – which is where we started. You are absolutely a good teacher. Now, what steps are you going to take in order to be even better? Because I’d had some positive feedback about a previous session where I’d put more emphasis on skills for building professional knowledge and skills, rather than tools to use in the classroom, always under the umbrella of pedagogy and the Marsden vision of course, I decided to present this week’s theme in a similar vein. So, in focusing on the future learning themes of communication and collaboration, I chose to think about this in two ways: ways we can collaborate as professionals, thereby modelling life-long learning skills for students; as well as how to encourage communication and collaboration with our students. After all, we’re all learners. I was hoping to have a teacher Skype into this session, but it wasn’t to be. This is an option I really want to explore further though, as I think it’s invaluable to hear similar messages from other voices. Nevertheless, I was particularly pleased with the collaborative Google Doc staff contributed to, to build a bank of ideas as to how to go about promoting or encouraging collaboration in the classroom. The workshop I ran was on Edmodo. Staff seemed interested in how this can be used. It was very helpful to have staff members in the workshop who have been exploring Edmodo both for its potential in enhancing the classroom, but also for its potential for connecting with other educators. The help sheet I produced for this session is available here. Since I began this future learning journey, I’ve been wondering what my ‘thing’ is. What would be the particular aspect of future learning that would really capture my imagination, and seem to offer the best possibilities to move forward with future focused pedagogy? It was never going to be just about integrating technology. Jumping on the bandwagon of the shiny new app strikes me as both short-sighted and not big picture enough. I wondered if PBL (project- or problem-based learning) might be the thing. But as interesting as it seemed, it didn’t seem to gain traction in my mind. Ditto SOLE (self-organised learning environments). Linked to both of these was the inquiry process. And I do think this is important, but didn’t seem to go quite far enough for me. It wasn’t going to be maker-ed, although I acknowledge the potential in this. And then, today, it hit me. Design Thinking might just be my thing. Why Design Thinking? Because inherent in this process are the 3 (or 4) Cs of critical thinking, creativity, communication – and collaboration. Because the process requires an inter-disciplinary approach. Because, as the Hobsonville Point team have convinced me, the New Zealand Curriculum aligns beautifully with it. Because it seems to offer the best of what PBL/inquiry/maker-ed calls for. And because I believe it has the potential to dovetail with the values of our school, such as aiming for the highest, service, resilience. And, crucially, because Design Thinking fits with me. So, I think, I’ve found ‘my thing’. As part of my current unit on ‘poetic geography’, I wanted my students to reflect on their poetry drafts, and to get feedback from their peers. I’ve used the whole ‘PMI’ (plus, minus, interesting) chart in the past, and also a modification of it: ‘smiley face, sad face, question mark’, to varying degrees of success. Then, in a tweet from Steve Mouldey (@GeoMouldey – where so many of ‘my’ ideas seem to come from…), I learned about ‘rosebud’ feedback. Watch the YouTube video about it here – courtesy of Lisa Palmieri (@Learn21Tech). And here’s the Google Presentation with the instructions I made for my class. I added the ‘helpful, kind, specific’ criteria after reading Andrea Henson’s blogpost trialling the same rosebud feedback activity (@AndreaHenson_nz). I was very impressed by how engaged the girls were. They really worked with focus for far longer than I anticipated. At the conclusion of the lesson, I wanted to know how the girls found the activity. They commented that they enjoyed it, but wanted less repetition in the feedback they were given by their peers. They also wanted more specific feedback, so that they really had a direction to move in to improve. It is clear that giving feedback is a skill that the girls will need more practice with, but this activity definitely showed me the benefit of a structured peer-feedback activity like this. The day before, I had a queue of students behind me, all wanting feedback from me. The next day, they wanted feedback from each other. With my Year 8 English class last term, we embarked on a novel study of Susan Cooper’s book King of Shadows. I’ve taught this novel for a number of years now, so it was time to try something new. Particularly in light of the ‘inquiry’ focus I’m looking to bring to this class. I decided I wanted to have the class make a website to reflect their knowledge and understanding of the text. In terms of process, the plan I followed was to introduce the class to the kinds of websites students usually go to to access information about texts: Wikipedia, Shmoop, Sparknotes. We thought about what kind of information is on these sites, the language that is used, how the sites are organised and laid out. We considered what someone wanting to know more about our particular novel might be after. This brainstorm eventually generated our ‘to do list’ and the various tasks students completed to generate information for our website. I did some lessons on digital citizenship. I tried to shift the focus away from the ‘don’t dos’ that the girls could easily and happily recite to me (‘Don’t post mean things’, etc.) and onto making a positive contribution to Internet-land. We decided on an appropriate time frame, considering that the teacher, as editor, needed time to look over everyone’s work, and that the website designer in the class needed time to upload and format everyone’s work. Students nominated the tasks they most wanted to attack, and the partner they felt they would work well with. I collated this information and allocated tasks on this basis. We also had a go at co-constructing an assessment schedule. And then we went for it! I was really excited to observe the engagement of the students in the task. They will openly and happily tell you that they didn’t especially love the book, but this didn’t stop them from being thoroughly engrossed in their work. 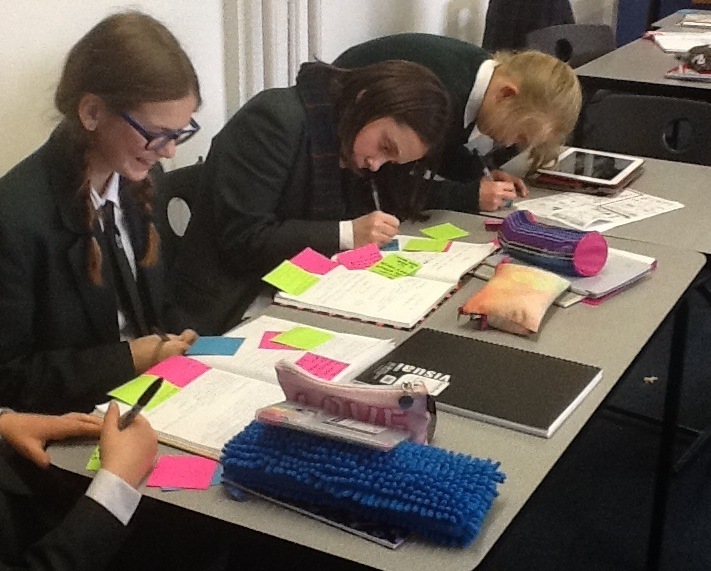 They came into class and got started straight away – no need from prompting by me. They sought very little feedback from me in terms of clarifying their understanding of the task. If they asked, I simply asked a question of them: ‘What do you think someone visiting the website wanting more information about the book will want to know?’ No-one came back for more help after this. I also liked that no-one blinked an eye when I sent work back to them for a second, third, fourth edit or proof-read. They accepted that if the work was being published for a genuine audience, it needed to be accurate and high quality. The finished product is here. I’m very proud of what the class produced. More time on digital citizenship, and to co-ordinate better with the school librarian to deliver this. Better co-construction of the assessment schedule. I don’t know how to do this well, and the way I went about it meant both that the girls lost interest, and we didn’t end up with something they understood or could use to self/peer assess their work. First things first – here’s the presentation! I do love Haiku Deck – beautiful presentations, guilt-free Creative Commons images, minimal text means avoiding inflicting ‘death by PowerPoint’. And my reflection will simply consist of saying that I was worried that I was presenting to a crowd who weren’t that thrilled to hear the message – especially with numerous network, server, internet and printing issues at present – but the staff seemed genuinely receptive. I am so grateful for the positive feedback I received 🙂 The next presentation won’t seem so daunting! I’ve been asked to do a presentation to the English Department on future learning and how my role as Future Learning Leader might help the department tackle the shift to BYOD next year. I thought I’d use the opportunity to try some new presentation software. Getting into haiku deck was a drawn-out process, and I found I couldn’t quite do everything I wanted to – but the final result is, I think, beautiful. As a learning tool, I think it would be powerful to get students or teachers to really synthesise their ideas down to the core. As I’ve blogged about before, I really like this framework as an overview of future (or 21st Century) learning skills. So, I thought I would have an initial play with the framework and adapt it to better suit the context in which I work. Thus, it reflects the New Zealand Curriculum, particularly its values and key competencies, as well as the Marsden pillars. Because the framework is very much a first draft (if for no other reason that my techie skills are pretty darn limited and it just doesn’t look that good), I’ve also thrown into one corner three verbs that I’m playing with as words that I feel best reflect the various visions and values and goals that Marsden articulates. I’d really welcome feedback, advice and suggestions – I reiterate that this is very much at a fledging stage, and may yet be used only for myself as I conduct some teaching as inquiry into my own pedagogy and classroom practice. Just putting my work and thoughts out there… So, what do you think? Collaboration is conversation – communication. Learning is “inherently social” – has to happen “between and amongst people” – to push your thinking, help you to see things in a different light – collaboration gives you access to multiple points of view. Collaboration amongst teachers is also positive role modeling – showing students that it’s okay to work together. ‘Collaboration’ can be seen as a “dirty word” because it is equated with “cheating” – but this is only the case if the end goal is a right or wrong answer. Woodrow Wilson: “I not only use all the brains I have, but all that I can borrow.” We can borrow a lot more brains through collaboration (and technology) these days – why limit yourself to only what you know? Collaboration points to the “importance of conversation” – not to be underestimated: the importance of listening – participate and contribute, but also listen and hear. This podcast really ‘demystified’ collaboration for me, and brought home that ‘group work’ is collaboration; a conversation with a colleague is collaboration; that collaboration is communication. Similarly, like always, there are ways to incorporate collaboration on a surface level so that you can tick that box and say you ‘do’ collaboration, but that there are also ways to explore collaboration in a deeper, richer, more meaningful way. Providing authentic learning contexts for students is possibly a way to do this. I was particularly struck by the concept of collaboration as ‘cheating’ – this is something I’ve been guilty of considering, but more in the specific context of NCEA and assessment. How can we assess against standards, but still promote collaboration? The notion of project-based, inquiry work versus finding the ‘right’ answer is true, but still, how can that be individually assessed? But then this question in and of itself indicates a bias towards assessing rather than learning – got to keep challenging my own thinking! Finally, as an English teacher, so much of what I do and promote in the classroom is discussion, I love the quotes by Wilson and Meyers – using all the brains you have for the room to be the smartest. Sharing thoughts is creating ideas. Collaboration is conversation – communication.